Auckland | Utopia – you are standing in it! The Greens are at it again proposing to build 100,000 affordable houses without ever explaining where the additional new land will come from. There would have to be an amendment to the proposed Auckland unitary plan to free up more land for there to be a net increase in the supply of land in Auckland. Unless there is that such amendment, a government plan to build 100,000 affordable houses in Auckland and elsewhere will simply be competing for the same fixed supply of land. If the supply of land is constrained from expanding by much, the only thing that will happen is that the price will go up with more money chasing the same amount of land and housing. 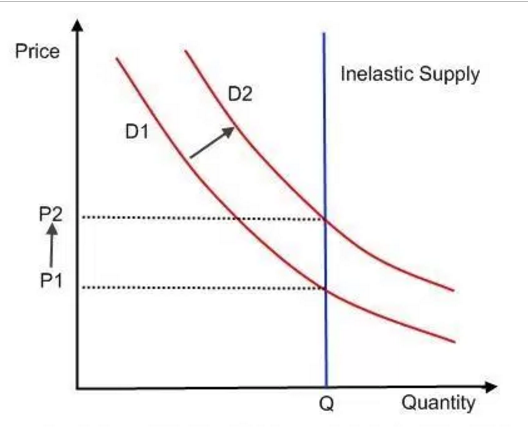 This entry was posted in applied price theory, economics of regulation, politics - New Zealand, urban economics and tagged Auckland, housing affordability, land supply, New Zealand Greens, RMA, The fatal conceit, zoning on August 5, 2016 by Jim Rose. 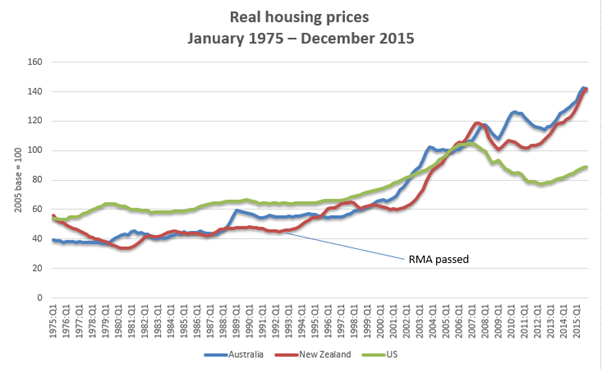 New Zealand housing prices were pretty flat up for the two decades until the passage of the Resource Management Act (RMA) in 1993. They then soared well before any foreign buyers such as from China entered the market. Source: International House Price Database – Dallas Fed December 2015; nominal housing prices for each country is deflated by the personal consumption deflator for that country. Most of the housing price rises were under the watch of a Labour Government – a party which is supposed to look out for working families. The failure of the Labour Party to nip the problem in the bud when they had a working majority in Parliament means future solutions run into the political problem that any significant increase in supply of land may push many with recent mortgages such as in Auckland into negative equity. Since they left office in 2008, leaving land supply regulation in a mess, the approach of Labour has been political opportunism rather than supporting RMA reform. Labour recently admitted the need to increase the supply of land, but have not put forward practical ideas to increase the supply of land. The National Party is not much better in terms of real solutions to regulatory constraints on the supply of land. This entry was posted in applied welfare economics, politics - New Zealand, Public Choice, rentseeking, urban economics and tagged Auckland, housing affordability, land supply, land use planning, NIMBYs, Resource Management Act, urban limits, zoning on April 24, 2016 by Jim Rose. Will Auckland become like San Francisco? This entry was posted in economic history, economics of regulation, environmental economics, politics - New Zealand, politics - USA, urban economics and tagged Auckland, housing affordability, land supply, land use planning, RMA, San Francisco, zoning on October 10, 2015 by Jim Rose. 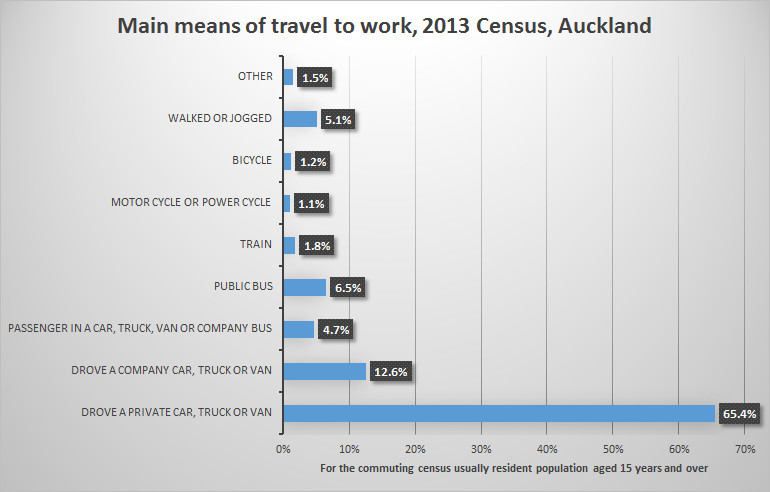 Bugger all Aucklanders take the bus (6.5%) or train (1.8%) to work. 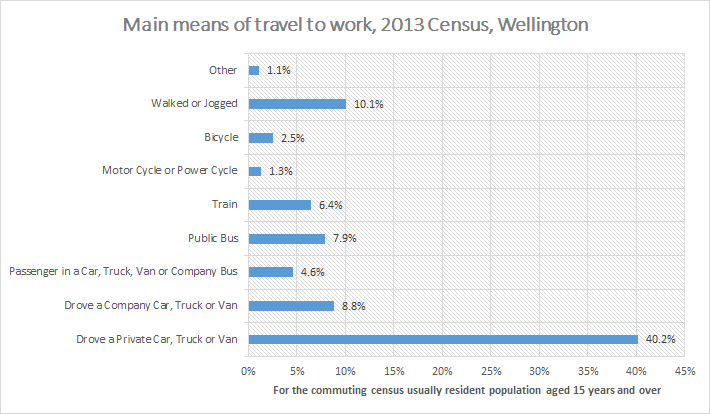 More Wellingtonians take the train (6.4%) or the public bus (7.9%) than in Auckland but more walk or jog than take either of those two publicly funded and subsidised conveyances. Hardly anybody takes a bike to work these days. Source: 2013 Census QuickStats about transport and communications. This entry was posted in politics - New Zealand, transport economics, urban economics and tagged Auckland, bikes, buses, commuting, cycling, trains, Wellington on September 22, 2015 by Jim Rose. I am not surprised only 7% of Auckland’s take public transport to work considering it takes much longer than any other form of commuting. Source: New Zealand Household Travel Survey: Travel to work, by main urban area results (3-year moving average). The average commute by public transport is 40 minutes as compared to less than 25 in a car. 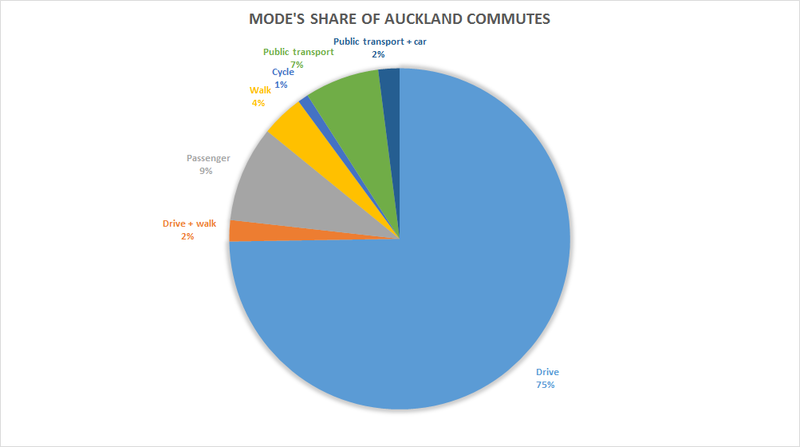 74% of Aucklanders drive to work and another 9% are a passenger in a car. No information was available on those who bike to work because only 1% of Aucklanders bike to work. Only 2% of all New Zealanders take a bike to work. 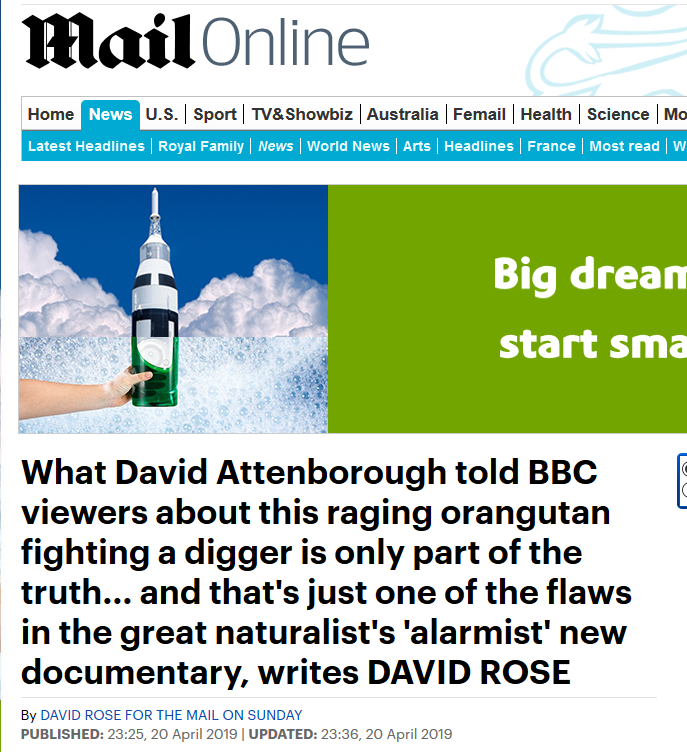 The sample size was therefore too small. Yet another reason to ban bikes at night. Few commute on this mode of transport in Auckland. The near identical commuting distances irrespective of the mode of transport except walking is further evidence that people are quite discerning in balancing commuting times and job selection as per the theory of compensating differentials. 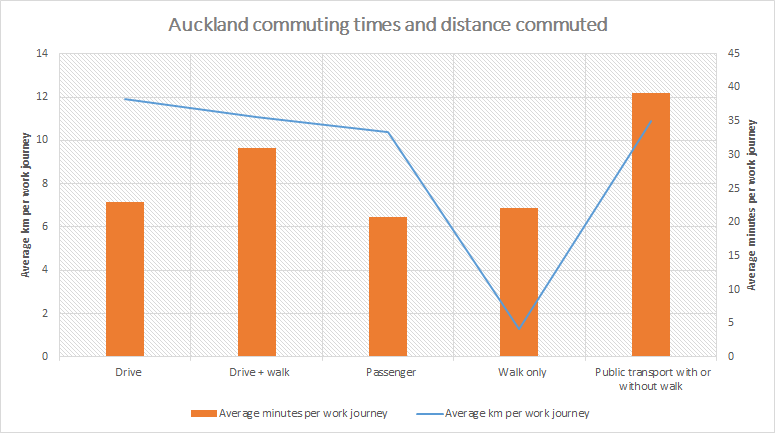 Indeed, average commuting times in Auckland are much the same as the average commuting time in America. The Auckland transport data showing people commute much the same distance by any mode of transport bar walking also validates Anthony Downs’ theory of triple convergence. If that expressway’s capacity were doubled overnight, the next day’s traffic would flow rapidly because the same number of drivers would have twice as much road space. But soon word would spread that this particular highway was no longer congested. Drivers who had once used that road before and after the peak hour to avoid congestion would shift back into the peak period. Other drivers who had been using alternative routes would shift onto this more convenient expressway. Even some commuters who had been using the subway or trains would start driving on this road during peak periods. Within a short time, this triple convergence onto the expanded road during peak hours would make the road as congested as it was before its expansion. This entry was posted in job search and matching, labour economics, occupational choice, politics - New Zealand, transport economics, urban economics and tagged Auckland, bicycles, commuting times, compensating differentials, expressive voting, green rent seeking, Inner-city Left, New Zealand Greens, public transport, rational irrationality, search and matching, The fatal conceit, The pretense to knowledge on August 21, 2015 by Jim Rose. This entry was posted in economics of regulation, politics - New Zealand, politics - USA, urban economics and tagged Auckland, land supply, land use planning, RMA, zoning on June 22, 2015 by Jim Rose. What will Labour do about the supply of land in Auckland? This entry was posted in politics - New Zealand, urban economics and tagged Auckland, housing affordability, land supply, RMA, zoning on June 12, 2015 by Jim Rose. 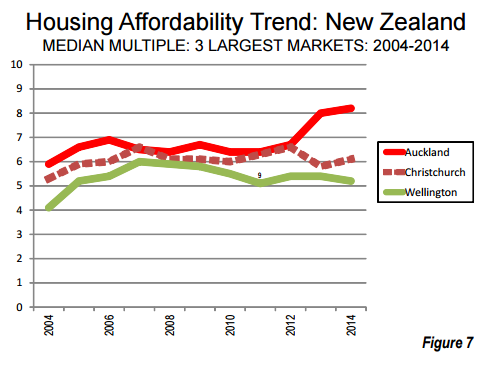 If the affordability crisis in New Zealand is demand side driven requiring capital gains tax to temper that demand, why is the affordability crisis so marked in one city? Does that make a case for a capital gains tax only on Auckland or suggest the capital gains tax is trying to solve the wrong problem. This entry was posted in applied price theory, economics of regulation, Public Choice, public economics, rentseeking, urban economics and tagged Auckland, capital gains tax, housing affordability, RMA on May 14, 2015 by Jim Rose.